Scientific conferences are one means by which scientists spread our knowledge and current research work. Since it is not possible for any one of us to know what is going on in the widely varied fields of astronomy, or even everything that is going on in one specific subfield of astronomy, we use conferences to keep tabs on the latest news. Plus, conferences are great places to network, to catch up with old friends, and to get some rare social interaction. Here at Texas, we are planning a conference to be held here in the fall. It is a conference specifically targeted at postdoctoral scientists -- researchers like myself who have a doctorate but are working at short-term jobs (often funded for just three years at a time) instead of long-term positions or professorships. It is a challenging and crucial point in the astronomy career. We no longer work under close supervision and guidance of a professor, as we did when we were grad students. Yet we are still learning the ropes, and the number of more permanent positions is much smaller than the number of postdocs. To help postdocs out a little bit, the McDonald Observatory Board of Visitors (the public arm of the observatory) and retired astronomy professor Frank Bash have set aside money for the postdocs to organize a conference every two years. The purpose of this conference is to bring postdocs from across the country and covering as wide a range of disciplines together. We'll hear review talks about many fields, and we'll have the opportunity to meet other postdocs and begin to widen our social networks. And hopefully, it will be a little fun, too. This will be the third such meeting, so we hope to build on past successes. But, like any even, this conference requires a lot of planning. Today we are having a meeting to discuss specific people we would like to have give talks at the meeting, and how to begin advertising the meeting. I am on the scientific committee --- we are concerned with organizing the talks on various subjects, coming up with a schedule, and getting a large turnout. Another committee deals with local issues and logistics, which I find more boring, but that are, in many ways, much more important than the scientific issues. So, there is lots to do! We're keeping our fingers crossed that we can pull this off successfully. For a week and a half now, I've been blogging about a conference on the Type Ia supernovae that I attended. It was a lot of fun, and I learned quite a bit. And, after today, you won't have to read my continual blatherings about the science there. But though the conference is over, the work is not. First, there are a lot of interesting scientific results to mull over, and questions that need to be answered. It will take many smart scientists working for quite a while to sort this out. And there is one other job I need to do. Today, as a lunchtime talk here in Texas, I'll be talking about the conference and the science findings presented there. Out of thousands of astronomers worldwide, only a hundred or so were at this conference. So it takes summaries like what I am doing to spread the news. It may be that people are not interested (in which case they won't come), but for the others, there is just too much going on in astronomy to keep up on it all. So we often rely on summary talks and review papers to bring us up to speed on what is happening in widely varied fields we may not be working in. I just hope I can do the conference justice. In the past few days, I've talked about the controversy of what types of stars explode as Type Ia supernovae. But the mystery surrounding these explosions is not limited to what explodes, but also how. When a white dwarf explodes, it is undergoing an uncontrolled nuclear reaction, turning carbon and oxygen into silicon, iron, nickel, cobalt, and many other elements. In a matter of a second or so, a sun's worth of carbon and oxygen is burned. But there is a question as to how it burns. Burning comes in two flavors. In a deflagration, or what you would call a normal flame, a flame moves more slowly than the sound speed. A good example is a wildfire, which can race across the ground at 60+ miles per hour (more than 100 km/hr), but even seemingly explosive burning, like gunpowder or an automobile engine, is still just a deflagration. In a detonation, the flame moves faster than the speed of sound. Most high explosives do this sort of explosion. Detonations are more destructive than deflagrations, which is why plastic explosives are used in modern warfare instead of kegs of black powder. In white dwarfs, the speed of sound is very high. In Earth's atmosphere, it is around 770 mi/hr at Earth's surface. Sound moves faster through dense material. For example, the average speed of sound through the Earth (as measured by earthquakes) is about five miles per second, or 18,000 miles per hour! Even so, this means it can take nearly half an hour for a sound wave to go through the Earth. White dwarfs, on the other hand, are much denser yet. Although the size of the Earth, sound waves can travel all the way through a white dwarf in less than two seconds at a whopping speed of over 14 million miles per hour! So, a white dwarf can completely burn in a matter of a couple of seconds and still not be a detonation. How can we tell how a white dwarf burns? By what it leaves behind. In a deflagration, the white dwarf burns pretty thoroughly, leaving behind almost no carbon. The same is true of deflagrations on the Earth -- in your car's engine, you burn all of the gas you put into the piston. In a gun, you burn almost all of the gunpowder. Otherwise, you are just wasting fuel! In a detonation, pieces of unburned material are sent flying. So, for a white dwarf, we would expect to see lots of carbon and oxygen left if it detonates. When we look at the Type Ia supernovae, we usually see a little bit of carbon and oxygen -- not much, but some. Neither the detonation or deflagration models really work! The truth seems to lie somewhere in between -- most of the white dwarf burns "gently," but somehow, somewhere a detonation explosion occurs, adding some extra energy and keeping all of the carbon from burning. The problem is, it really is difficult for theorists to explain why one type of burning would turn into another type. So, at meetings such as the one last week, scientists argue very heatedly about their latest models. This isn't work that I do, so I am not qualified to make a guess as to which models are more likely to be correct. The picture above is a model of a white dwarf deflagrating ("gently burning"). The yellow-orange is the unburned white dwarf, while the grey/white indicates where the flame has already burned the white dwarf. You can see that, as the burning continues, the heat causes the white dwarf to get larger. Soon after the phases pictured above, the flame reaches the surface, and the ashes are spewed into space at a speed of 10,000 miles per second! This update is a few days later than promised; I happened to get involved in some discussions during breaks in our conference, and by the evening, I was too tired to go online. So, although the conference is over, I'll continue to try to bring things up to date. So, remember that we were talking about Type Ia supernovae, some of the most intriguing explosions in the Universe. There are two suspects for objects that form these particular explosions. 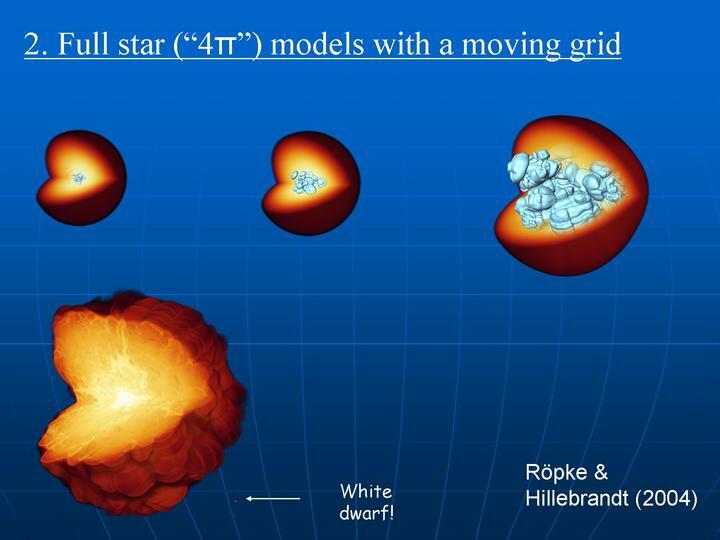 The first, discussed last time, involves a white dwarf pulling mass from a companion star until it reaches the all-critical "Chandrasekhar mass," about 40% larger than the sun's mass, at which the white dwarf would undergo a thermonuclear explosion. Today we talk about the second mechanism, the double degenerate model, so called because it involves two white dwarfs, and white dwarfs are also known as "degenerate stars," because when you pack the mass of the sun into something the size of the Earth, the matter enters a state called degeneracy. The way the double degenerate model works is fairly simple. If you have two white dwarfs orbiting each other, over time they will get closer and closer. This is because under Einstein's Theory of General Relativity, the objects radiate "gravitational waves," which carry energy away from the system. When the white dwarfs get close enough, they will merge together. If their total mass is over the Chandrasekhar mass, the combined white dwarf will explode! Of course, the devil is in the details. As the white dwarfs get close, if one is more massive than the other, the bigger one will rip the smaller one to shreds. We'd get the white dwarf version of Saturn, in which a white dwarf (with the mass of the sun squeezed into a ball the size of the Earth) would be surrounded by rings with a mass of half the sun or more, still in that weird state of degeneracy. This is really hard to study from theory, and we certainly have never observed a star in this state. Maybe the remnants of the second star will fall onto the bigger star quickly, which would cause an explosion. But if they don't fall on quickly enough, the system may cause big winds that will blow the smaller star's remnants away. Perhaps a bigger problem is that we only know of a few white dwarfs in double degenerate systems, and only one of these is above the magic "Chandrasekhar limit." For these to cause Type Ia supernovae, there should be dozens in our Milky Way that we should be able to see. Maybe we are there and haven't found them yet. But maybe these aren't the parents of Type Ia supernovae. So, in short, we really don't know what causes Type Ia supernovae. This is really disturbing, since we use these explosions to study the distant Universe. But it is a mystery I think we can solve, given some more time. Over the next few days, I'll summarize a few other controversies from the conference that are quite interesting. Yesterday I mentioned that I am at a conference discussing exploding stars known as "Type Ia Supernovae." I also mentioned that there are competing hypotheses about what causes these explosions. Today we'll briefly mention one of these: the so-called "single-degenerate" channel. A degenerate star is a star made out of a type of matter that is packed so densely that it cannot be packed tighter. It is like taking the sun (which is nearly a million miles across) and squeezing it into a ball the size of the Earth. We also call such a star a "white dwarf," because it is small and glowing white-hot. The vast majority of white dwarfs slowly fade and cool away. Yet if a white dwarf gets heavy enough, the material it is made of is squeezed until it stars a nuclear reaction that, in a matter of a few seconds, burns the entire star and causes a supernova explosion. The magic mass limit is known as the "Chandrasekhar mass" after famous astrophysicist Subrahmanyan Chandrasekhar, who calculated this magic level. If a white dwarf is not at the Chandrasekhar mass, it will have to gain matter until it reaches the Chandrasekhar mass in order to cause a supernova. One way to gain matter would be if the white dwarf happened to be close to another star, the white dwarf's gravity could pull gas from the other star onto the white dwarf. We see white dwarfs pulling matter from nearby companions. These are called "cataclysmic variables." Dozens of these systems are known. But what we don't know is if these cataclysmic variables will end up sending enough matter to the white dwarf to cause the white dwarf to explode. The reasons for this uncertainty involve very complex physics that we can only partially model on computers. So, we don't know if any of these systems can ever make a Type Ia supernova. Many astronomers at this conference believe this is the best way to make the supernovae, but others disagree. Tomorrow I'll discuss the other competing theory for making Type Ia supernovae. This week I am at a conference on a specific type of supernova, a type astronomers give the exciting name "Type Ia." So, today I'll discuss a bit about why we are having this conference, and over the week I'll try and point out some interesting findings at this meeting. There are two main types of supernovae. One type occurs when a very massive star at least 8 times heavier than the sun burns its nuclear fuel into iron. Iron cannot be used as fuel, so it builds up until the star collapses on itself, which ignites a supernova explosion. Type Ia supernovae are different. Stars that don't go supernova as described above form a white dwarf, which is an ultra-dense ball of carbon and oxygen the size of the Earth. It's essentially a giant pile of ash left over from the star's nuclear furnace. Normally, these ashes slowly cool and fade, just like the embers of a dying fire. But in some cases, the white dwarf is somehow made to ignite in a thermonuclear deflagration -- in a matter of seconds, the entire white dwarf fuses carbon into silicon, iron, and nickel, among other metals. These explosions are so bright that they can be seen most of the way across the Universe, billions of light years away. The problem is, we don't really know how these explosions get started. In the coming days, I'll mention some of the ideas. But none of them really work all that well, which is why we are having the meeting -- to try and make progress in science. Tempers will run high, as this is very controversial stuff. It should be fun! Yesterday, March 14, was Albert Einstein's birthday. He would have been 128 years old. Of course, if he'd been moving near the speed of light, he'd be much younger. If his parents had put the infant Albert in a spaceship similar to Superman's childhood spaceship, Einstein could have been arriving at the star HD 28185, a near-twin of the sun which has a planet five times the mass of Jupiter orbiting at the same distance from the star as the Earth orbits from the sun. It's a shame that his parents didn't think of this. Of course, we'd have to wait another 128 light years to learn what the planetary system was like. As you might guess from the light blogging and whimsical entry, not much is happening this week that I think you would find interesting. This weekend I read this article about how scientists have measured an asteroid's rate of rotation (spin rate) increasing due to sunlight. This effect is called the YORP effect, after the scientists who first described it: Yarkovsky, O'Keefe, Radzievskii, and Paddack. The effect is very subtle. (When astronomers say "subtle," we often mean "complicated and hard to wrap your brain around.") When sunlight hits an asteroid (or any planet), much of that sunlight is absorbed and converted to heat. This is why the temperature warms up in the daytime! That heat is then radiated back into space as infrared photons. Photons carry momentum. They carry very small amounts of momentum, but when you have gazillions of photons, that momentum can start to add up, especially for small things. Particles of dust in space near the earth spiral into the sun in less than 3000 years due to momentum from this infrared radiation. In order to change the spin of an asteroid, it has to be odd-shaped. Think of this kind of like a windmill. If you put a ball on top of a tower, the wind won't cause it to spin. But it you put up odd-shaped blades, you can make a windmill that spins very rapidly. The effect is similar for asteroids. Round asteroids (and planets) don't get spun up by sunlight, but odd-shaped asteroids can. In fact, many small, funny-shaped asteroids spin very fast; this theory explains why. So, what is the news here? Until recently, this effect was a hypothesis. We had never measured any asteroid spinning faster and faster. But now Stephen Lowry, an astronomer from Queens University in Belfast, has led a team that measured the spin rates of two asteroids: 2000 PH5 (this asteroid doesn't have a "real" name yet) and Apollo. And the spins of these rocks are increasing at a rate consistent with theory. What does this mean for you? Another effect similar to the YORP effect, called the Yarkovsky effect, claims that the actual orbits of asteroids could be changed from the momentum of light. If this theory is true, if we find an asteroid that will one day in the future hit the Earth, we could change its orbit by "painting" part of the asteroid with white dust rather than needing to launch a nuclear weapon or a large explosive. However, we need to be sure we understand the effect first, or else such deflection may not work or may even work in reverse, causing a rock to hit us all the sooner. In this blog, I've tried to steer clear of discussions involving politics. This is because such discussions are rarely scientific (by which I mean involving more emotion than fact), and discussing politics is a good way to alienate at least half of you very quickly. Besides, we are innundated with political discussions on TV, in the newspaper, over the radio, and throughout the internet. Adding my voice to the cacophony will accomplish little other than to waste my time and breath. But, today, I will briefly stray into the political arena before turning tail and running back to my science discussions in future blog ramblings. Yesterday I happened across this news story from Reuters discussing the contents of a memo sent to some U.S. scientists regarding the appropriateness of discussing climate change in foriegn meetings. Specifically, the memo appears to require the scientists to avoid discussing certain topics (such as the impact of global warming and melting sea ice on polar bears) when at meetings overseas. I find this news article quite disturbing, although I must admit I have not seen the full memo. In politics, it is quite common to have discussion topics limited and for participants in those discussions stick to well-defined talking points. We see this, for example, during presidential debates. The moderator will ask a question about a politician's position on strains in relations with the Duchy of Grand Fenwick, and the politician "answers" with some statement about supporting freedom fighters in Freedonia. Control of the "message" is of primary importance in politics. In scientific debates, such tactics go over like a lead balloon. Although scientists will argue passionately and emotionally for their favorite theory or interpretation of data, the vast majority of scientists are willing to listen to a well-argued opposing viewpoint. In scientific meetings, the vital component is a free exchange of ideas. Asking a scientist to refrain from discussing topics that might come up from a meeting is an affront to the scientific process, especially since the ideas in this case (polar bears and global warming) are not secrets key to national security. Not to mention that, as citizens of the United States, we are guaranteed the right to free speech. One could argue that, since the money these scientists are paid comes from the federal government, that the government should be able to retain some veto power. But this is not how science has been done in the U.S. since at least World War II. Goverment agencies award money to scientific researchers for the purpose of a specific research project. These projects do have to obey some pre-set, sensical rules (such as obeying ethics rules, meeting minimum scientific standards, and so on). But the agencies awarding the funds do not attempt to influence the outcome of the research, and for good reason (just look into the history of the so-called "scientific" research of the Tobacco Institute). U.S. scientists who are attending scientific meetings on global warming, climate change, or polar bears are not rushing off overseas to burn american flags and shout anti-U.S. slogans. They are partaking in the normal scientific process trying to understand issues. If we cannot freely debate questions such as how much of the polar ice caps will melt, we cannot understand what impact global warming will have on our society. Preventing discussion of polar ice melt does not prevent the melting itself. The only thing it inhibits are discussions on what the impact on humans will be, and what, if anything, we can do to minimize or reduce those impacts. And that is an issue of national security. One vital part of science is sharing our research with each other. One of the main ways this is done is via articles in journals. These are more specialized than magazines, and have fairly strict editorial policies. You've probably heard of some scientific journals -- the New England Journal of Medicine (I don't publish in that one), Science, and Nature are all mentioned in news articles almost daily. In astronomy we have our own subset of journals, such as the Astrophysical Journal, the Astronomical Journal, Astronomy and Astrophysics, and many, many others. I am wrapping up some research this week, so I am preparing to write up the work to publish in a journal. Like other authors, we don't just sit down and start typing. I have written up an outline for the paper; I'm collecting my data for tables in the paper; I'm trying to clean up some loose ends in the research, and so on. It's quite a lot of work and amazingly tiring. I work all day and go home with part of a paragraph, a data table, and a partially-finished graph. But it is all necessary -- I can talk about what I've discovered until I am blue in the face, but until those data appear in print (meaning that an independent scientist or two has checked things over), other astronomers won't fully believe it. From our Earth-based view, tomorrow's total eclipse of the moon is caused when the full moon slips into Earth's shadow. But from the moon, it appears that the sun passes behind the "new"-phase Earth. As I mentioned yesterday, from the moon you would see every sunset and sunrise on the Earth at one time. Today's Astronomy Picture of the Day shows a simulation of what an astronaut on the moon might see if she were to look back at the Earth during a total eclipse. Why do I say that, during the eclipse, it appears that the sun is passing behind the Earth? You probably remember how the moon always keeps the same face toward the Earth. This phenomenon means that, at a given point on the moon, the Earth appears to stay at the same place in the sky. The sun and the stars will move through the sky once each month, but the Earth would appear to magically hang in the sky, changing phases once every moon day (the moon spins once every lunar cycle). So, as the Earth waned from a thin crescent to the new phase, the sun, moving through the sky as the moon turned, would pass behind the Earth, plunging the blisteringly hot midday moon into a few hours of brutal, but beautiful, cold. Those of you in the Eastern U.S. will, weather permitting, see the moon rise on Saturday night while in the middle of a total eclipse. 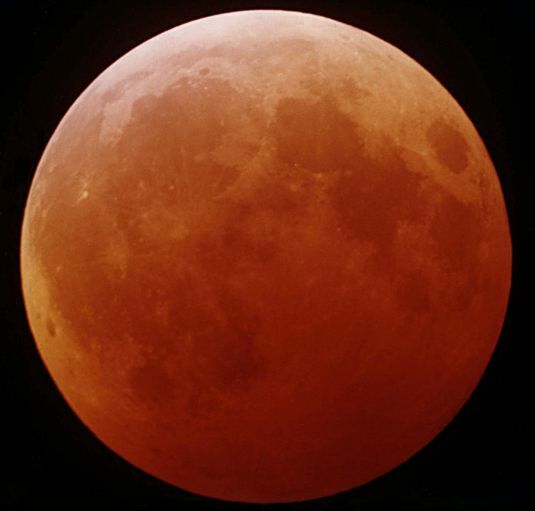 Instead of a bright yellow or white moon hanging just above the eastern horizon, you will see a coppery red moon. If you live in Europe, you get to see the entire eclipse, while those west of the Mississippi will only get to see the end of the eclipse (a partially-eclipsed moon) when the moon rises. If you are in the far west (Idaho, Utah, Arizona, or further west), you will miss out this time. If you want to look for the eclipse, look east shortly after sunset. Remember, a total eclipse of the moon can only happen at the full moon, when the moon is exactly opposite the sun in the sky. So, as soon as the sun sets, the moon will rise on the opposite side of the sky. Want more information about the eclipse? Look at this article. On a side note, why does the eclipsed moon look red? After all, an eclipse of the moon happens when the moon passes through Earth's shadow, so shouldn't it be dark? If the Earth had no atmosphere, then this is true. The moon would be almost completely dark (though a small amount of light from the sun's outermost atmosphere would still shine, though weakly). But Earth's atmosphere bends sunlight around the edge of the Earth. Further, the atmosphere tends to filter out the blue light (this is why the sky is blue! ), so just the red light passes through. (This is also why sunsets are often red or orange!) So, if you were on the moon during a lunar eclipse, you would see every sunset in the world all at once -- the Earth would be a dark sphere surrounded by a brilliant reddish orange ring! The same sort of effect was visible from Earth when the planet Venus transited the sun in 2004. If you look at this picture of the transit. In the picture, a bright arc of light extends around the part of Venus that is beyond the sun's limb, AND you can see darkening and reddening of the sunlight caused by Venus's atmosphere around the part of Venus still covering the sun. Cool!